Valentine's Day is right around the corner, so I hope you already have an idea of what to get your sweetheart. If you don't, I have the perfect list of pink and red gifts that are sure to put a smile on her face! I love those pink mules. So cute! 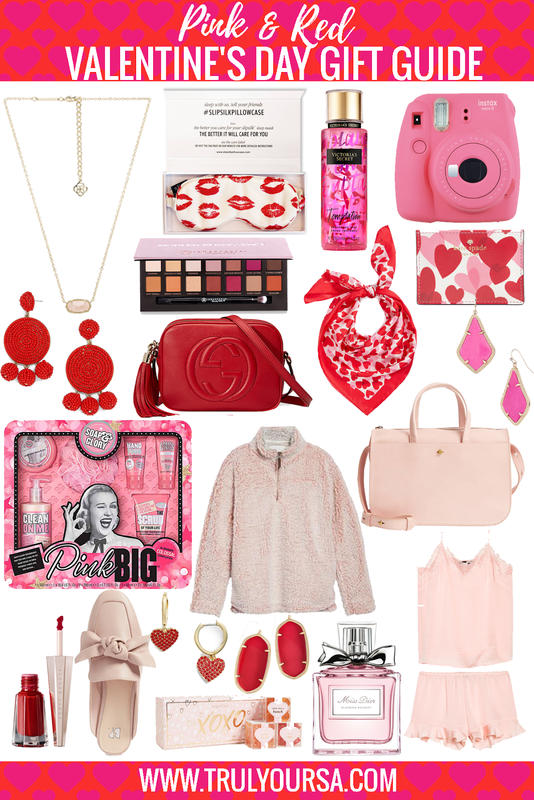 Love all these pink / red ideas for Valentines! Ahhh loving everything in this gift guide, I'm going to have to buy it all for myself, ha! Ahhhh so many serious goodies! I have been eyeing those mules for a while, and the color is so good! I love all the blush pieces! These are all so cute!! I am loving the pink mules and those red earrings, so cute! So many cute pink and red picks! I love Valentine's Day! Oooh I have a couple of these things and can highly recommend them! I wanna add those fun vibrant red earrings to my list! Cutest gift guide! I have the pullover & am obsessed! I love Valentines Day just because pink and red is like my fave color combo ever! I love those statement earrings!